It’s being called Shazam for beer. 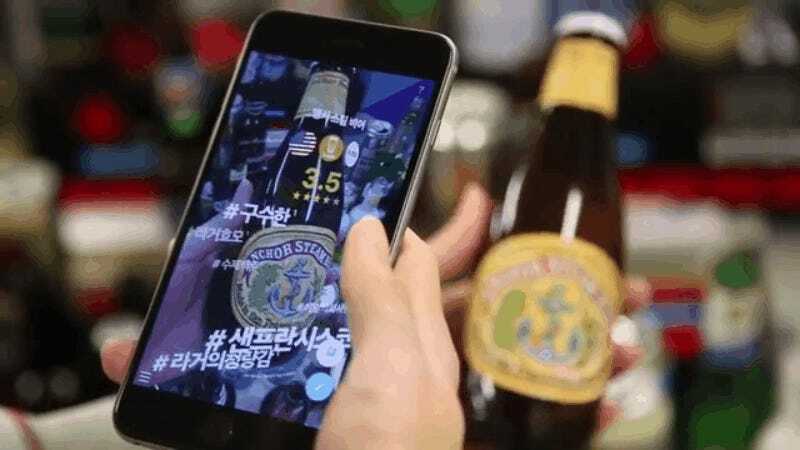 Tech in Asia is reporting on Letsee, a startup in Korea, that just released a smartphone app of the same name that lets you learn more about any beer in front of you using augmented reality. Simply hold up your phone’s camera to a bottle or can label, and the on-screen AR display flashes all kind of useful information: the basics, like alcohol percentage and country of origin, plus user review hashtags like #fruity or #damntasty. Using smartphone cameras to learn more about booze—or anything else readily available around you—is becoming more common. In terms of alcohol specifically, the Japanese government recently announced a new bilingual app that scans sake labels, written in Japanese, and translates them for non-Japanese-speaking tourists. There’s also Blippar, a similar app that lets you scan stuff around you to get information about it in an AR display, or lets you interact with brands using crazy 3D graphics. While it doesn’t pull up beer flavor notes and user brewski reviews, it did partner with Heineken earlier this year: you use Blippar to scan a Heineken bottle and you’ll get a sustainability report from the company to learn more about how the beer was made. Letsee also works with stuff other than beer, like books and cosmetics, so this is a slowly but increasingly crowded space. Right now, Letsee’s beer app looks like it’s only in Korean, but it just came out in South Korea a week ago, so hopefully we’ll be scanning and sipping beers in a more informed manner Stateside very soon.